NEW DELHI: It was 1999. My boss was retiring and wanted to sell his equity shares. I unsuccesfully tried to convince him to hold on if he did not need the money immediately. Finally, I bought 200 shares of HDFC Ltd from him at the then market price of ₹100 each. Around the same time we bought a house in Navi Mumbai. It was about 6 km from my then office, and in the lane next to the kids’ school. We took a loan and paid ₹20 lakh for it. We still own the place. This is a story I do not tire telling. So which was a better investment? The property or the equity share? The property was in an area that saw dramatic development over the years. New roads and infrastructure came about and property prices appreciated. The house is today worth ₹2 crore. My father-in-law would have beeen pleased. He persuaded us to buy it and told us one never loses money in property. He would, however, not let us sell it even at this price. The house is now really old. People now use marble and granite; windows have glass not grills; bathroom fittings are fancy; new developments have gardens and play areas; and households need at least two parking slots. Our house will not tick any of these boxes, but there will be buyers if we tried hard and persisted. The shares of HDFC Ltd paid us dividends every year. The shares split further and bonus shares were offered. Without an additional rupee of investment, we now own 2,500 equity shares. At the current market price of ₹2,300, this investment is worth ₹57.5 lakh. That is a compounded return of 32% per annum over 20 years. If we did a comparable calculation for the house, its compounded return is about 12% per annum. The house appreciated about 10 times in value over 20 years. The equity shares appreciated 287 times in the same period. Buying property is not better than buying equity. Why do we love the property market? There is a constant demand as owning a house is aspirational. People buy a house earlier in their lives now than before. As incomes increase, people buy more than one house. What does a company like HDFC, which looks at the same things I just listed, do? 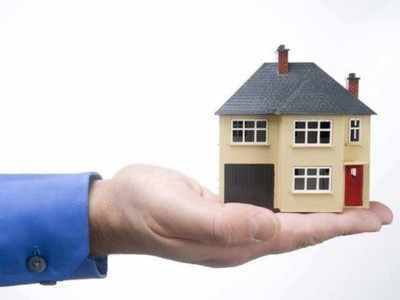 It recognises that the market for home loans is large. It knows that higher incomes mean bigger loans and better repayment capabilities. It finds people buy more than one house, and therefore, there are repeat customers. It builds a fine business that can efficiently evaluate an application and sanction a loan quickly. It introduces new products to attract home buyers, ties up with developed properties to provide value added services, and makes it easy to get a housing loan. It expands its business and captures the growth in the market for loans, and runs a high quality balance sheet. Thanks to the attachment to the house, loans are repaid in time. Even a glitch in the market where the loan is only on the “white” portion, helps the business. The owner’s stake is higher—the “black” component is contributed by the owner. So defaults are low. HDFC Ltd thus grows its loan book at a rapid clip, keeps costs low, expands to newer markets, and virtually has the lowest non-performing assets for a lending institution. What happens to the share price of such a stock? It appreciates and acknowledges the blue chip status of the business and emerges as a market leader. It is the same housing market. We use our limited resources and skill to identify property, and invest a disproportionate amount of our wealth into it. We can delight in its appreciation in value over time, and tell that story. But that would fall so woefully short of the story a business will build out of the same opportunity. Our house that was bought for ₹20 lakh should have appreciated to ₹57.5 crore to equal the appreciation in the shares of HDFC Ltd over 20 years. The appreciation in the value of the HDFC Ltd shares reflect the challenges the business faced, the opportunities it leveraged, and the profitability it sustained and enhanced over the years. How could an asset like property, that simply leaned on the possibility that its location will become valuable with time, compete with that? Even as we obsesses with our little emotional decisions within our households, there are others that are building stronger propositions that are grounded in better competence. To ignore equity investing is to ignore that opportunity. When we invest in property because we love it, we short change our wealth.